A list of all the Hotels featured on Hotel Hell, whether they are open or closed with further information on the establishments featured and episode recaps. There are links for extra reading and links to review sites for real customer opinions. Each season of Hotel Hell updates are split below with air dates and closure rates, separated by season and as an overall figure. Amazing!!! Gordon Ramsay's "success" rate is just as bad as his "Kitchen Nightmares" success rate!!!! Why doesn't he take the hint & just concentrate on writing cookbooks???? Wonder how all his resturants are doing??? How MANY of THEM have CLOSED?????? Very silly comment. The people that Gordon helps in these shows are already so far in debt, then many go back to their old ways. Look at half of them, they are raving delusional lunatics. Gordon can only do so much. And his success rate for Hotel Hell isn't the same, not even close, it is higher. I agree. He gets to these people when many of them are already on the verge of closing within months. In many cases it was too little too late. You can have the best guidance and help in the world, but at a certain point there is no turning back. You're in too deep. That's where many of these places are. Except for Season 1, the closure rate is 0%. He proves that the businesses can be successful, if managed correctly. It's not his or the producers' faults if the owners can't take the advice given or are too far in debt to continue running their businesses. You can see by how the owners behave and how often he has to bring in new staff that a lot of these places lack anyone competent enough to maintain the standards he puts in place. What are you talking about??? 3 out of 18 hotels have closed. That's a pretty good success rate to me! As the others have said, many were on the verge of closing anyway so only having 3 close, and being able to bring the others back around is pretty good! Only 17% of them closed, wtf are you talking about? That's way better than the rate for the restaurants. 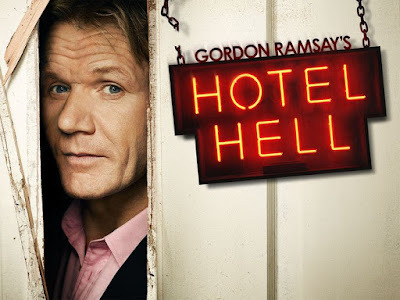 On Kitchen Nightmares and at Hotel Hell his success rate is increasing with ongoing seasons. If you look at overall Closingrate on Kitchen Nightmares its not impressing. (season 2 all restaurants closed) but he got to almost 0% closing rate at the restaurants. Like others said, often they're already far in debt, and there are little to no chances of saving the place, he just helps them getting a bit out of debt so they won't lose the house, pension, life's savings or whatever it is they put into it, and then they can close without having to file for bankruptcy. Also it's not his fault if those assholes who think they know better revert to their old ways, not to mention that it works when he's in town cause he himself attracts people, and he insists on quality in the kitchen. Keep also in mind the big recession, that hit hard everyone, someone who was already struggling had basically no chance of making it, and others decided to close to focus on family or they sold cause they got a good offer etc, but with Gordon's help they didn't end up losing everything at least. Of course the success rate is higher in the last seasons duh, it's been less time. Will see in 4 years if they're still there. Did you even read the article? There were only four of the hotels that were closed, and 16 hotels stayed open with some already having a different branch somewhere and another planning to have branches on different states. The success rate is high. You gotta be kidding. A nearly 80% success rate is pretty awesome, really. It's only 3 of 15 hotels! Based on your 'standards' most school systems in the US would have been completely shut down long ago, because their graduation rate is lower than 79%. Not a bad success rate and even if the closure rate was 100% it's still super entertaining! I love Gordon! As an industry insider I have intimate knowledge of many of these properties and their stories and have spoken to several of their owners. What Gordon did with each property was to point out the obvious (sometimes only obvious to a professional). The issue is that knowing a problem exists is only the beginning of solving the problem -- you must then fix the issue(s). Many of the property owners were either unwilling or completely incapable of changing things and for those who did it was a hard and sometimes expensive road toward success (with many of them still struggling). Not everyone should own a business and the rule of survival of the fittest applies. However, if you're willing to take the advice of professionals and implement the necessary changes you have a greater chance of succeeding. Kudos to Gordon for being willing to step into the mess not of his own making and give them advice that could save their business. Season 1 was pretty brutal but only because Gordon is so passionate -- he's softened over the years and it tends to be more palatable to the owners. I am suprised he can help save any hotels or restaurants. Do you see these people, they are stubborn and clueless. Most have no business being in business. in year around 2025 or something,some of these hotel will closed their door and people will start blaming Ramsey for that,like what happen with Kitchen Nightmare.The show is fun tho. Considering these successes, I'm guessing there's something about the hotels that make them better able to weather bad times vs plain ol' restaurants. Or the skills necessary for opening and running a hotel just make the people Ramsey deals with somewhat better at adopting to change, heeding his advice, and maintaing the discipline not to go back to the old destructive ways. Inspiring to see someone who cares, TV coverage or not. Personally I enjoy both shows, kitchen & Hotel nightmares/Hell. Well done G. Ramsey! if these ignorant owners would just realize that they need to do what he says, they would still be in business. It's simple. Keep it simple, fresh local and clean. if I was the wife of that snotty arrogant Sherlock Holmes want to be, I would have had the divorce done before the ink on the papers for the hotel were dry. Considering the financial ruin that most of these are in before Gordon ever gets there, I think his success rate is phenomenal! It's much better than the restaurant rate of success but then again control is most of the problem. The owner wants control over everything that happens and they know nothing and don't sit back and let their staff do what they need to do to make the restaurant or hotel as success. That's where they get into problems and that's why they fold. The common things be they restaurants or hotels, is a lack of common sense.